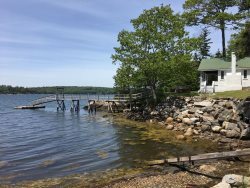 This cottage is located on Rutherford Island, in the town of South Bristol, and overlooking John's Bay. Picturesque Christmas Cove is less than mile away. Upon entering our the Cottage, you will find.. .An open floor plan for the main floor living room, dining area and kitchen, with 25 ft ceilings and skylights for a natural lighting effect. There are two sliding glass doors and many over-sized windows for enjoying the panoramic ocean view. The tongue-and-groove pine wood paneling throughout the house and wood floors create a cozy, wooded ambiance. The wood burning stove in the living room is perfect for a chilly evening. The main floor master is very spacious, with a walk-in closet, and the upstairs bedroom is also large with ample closet space. The upstairs has an entertainment loft with a pull-out bed and an adjoining office area. At any time during your stay, you can step outside to enjoy the ocean on the private deck, pier, dock, rocks, or low tide beach. Towels üIf you are using the sheets and towels that are provided by this property please launder them before your departure. If you do not wish launder them, you can bring your own OR rent them from our office and return them unwashed.